I build all types of banjos, not seen on website. please contact me for custom orders or questions. This type has a wooden tension hoop that is tightened with machine screws from the top. See pics below. There are threaded inserts in the rim for durability and easy adjustment. The tension hoops are made from hard maple, capped in ebony or rosewood, they are very strong and the exotic cap makes them even stronger. The hide head has a traditional square metal flesh hoop so the head will never slip loose. I use a good grade of hide for the best tone and it's extremely durable. The heads should easily last a life time of normal use unless they get cut somehow or stretched from over tightening. These banjos are extremely comfortable to play, no cold hardware to chill your skin and poke into your legs! 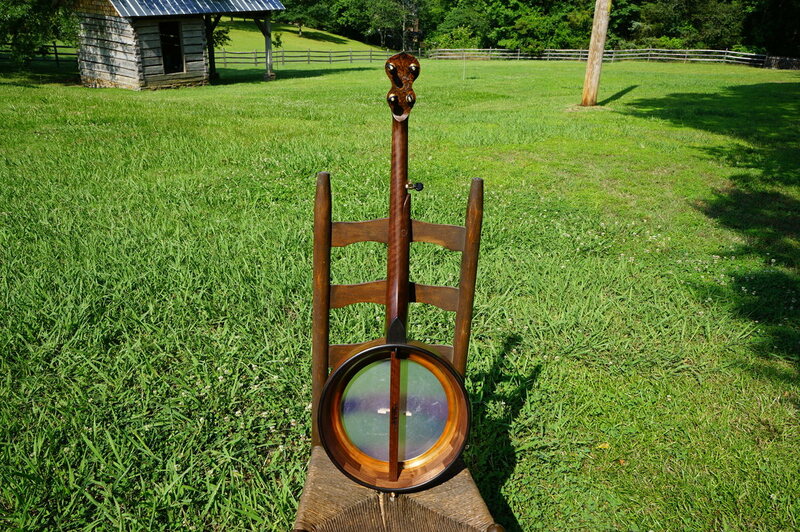 Also, since there aren't any bolts, hooks; bracket shoes or metal tension hoops the banjos are very lightweight! It's a pleasure to pick up and handle such a light banjo! And the light weight really opens up the tone! The tone is resonant and mellow, speaks equally across the strings and at any fret. It's nicely balanced for any type of string. 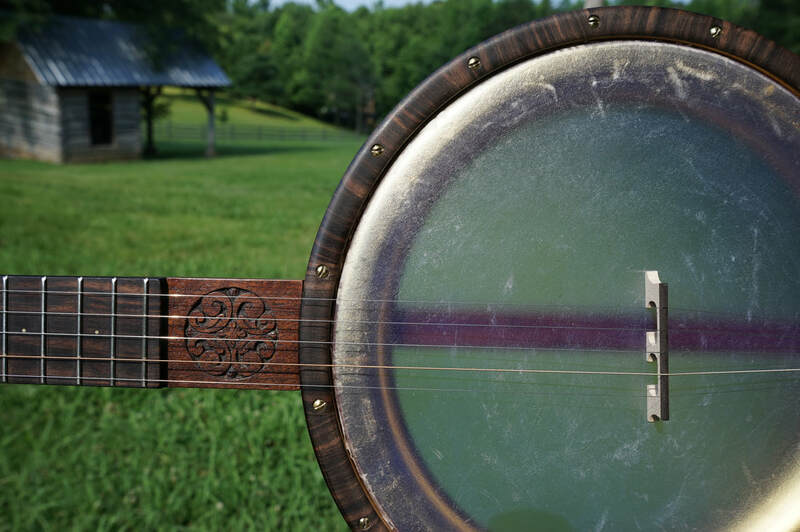 Most banjos favor one string type (steel or gut) but these sound great for both! ​​To consider tone rings, you must also consider the wood. Different woods give different tones. Cherry and maple give you a more focused sound, due to greater internal dampening. So, you hear individual notes more strongly and they diminish more quickly. Walnut gives a warmer, woody sound; you hear more resonance and it seems more forgiving. The tone is more open. Describing tone is like describing color-it's best to form your own opinions from the sound clips found own each banjos page. NO tone ring is a wonderful option. Don't neglect it, it's very balanced; warm and open, fun and forgiving to play. The thin brass ring adds some pop across the strings and density to the treble. The Dobson ring adds a chime like resonance and increased treble. It can also open up the tone of cherry or maple for more resonance. Rosewood adds a brightness while keeping a natural woody resonance. The treble increses without a metalic ring. I set the banjos up with heads reasonably tight for the best tone. The head shouldn't sag much than a 1/16 to a 1/8 of a inch in the middle. But you should set it to your preference. It will change the tone very very much. If the head is a bit loose, tighten the screws by a quarter turn all the way around the rim and do it as many times as necessary. Humid seasons will need tightening and dry seasons might need loosening. Its no harder than tuning the strings so don't be worried. The tone of a natural hide is far superior to a plastic head and well worth it! Also, It's a good idea to keep a selection of bridges around to change the action. The action must be high with nylgut or minstrel strings to avoid buzzing but they're so easy to note, it's no big deal.